Are you already suffering from a case of the winter blues? Yes, you could look for the highest mountain and snowboard along its snowy slopes or you could try something a little more… colorful this season. Why not, for example, strut your stuff in a frozen wet t-shirt competition or watch colossal snow monuments transform into colorful spectacles? There’s no need to partake in the ordinary activities when each of these five quirky winter festivals has just what the doctor ordered to melt your winter blues away. Grandpa Bredo Morstoel can rest cryogenically in peace knowing that his death did not occur in vain; that’s because the Frozen Dead Guy Days brings some warmth to Colorado’s frigid winters. After passing away from a heart condition in Norway, his body was transported to be preserved in a shed, where he reportedly still chills out. In early March, the Frozen Dead Guy Days is attended by revelers, many of whom are dressed like dear old gramps. Each year they are drawn to the festival’s peculiar activities like racing with coffins, t-shirt competitions that are not only wet but frozen, as well as a parade that ironically moves in super slow motion. If you pictured celebrators dressed as Santa Claus while balancing pudding on plates, then you’ve probably heard of the Great Christmas Pudding Race. Even if you’re a stranger to this weird British craze, you might be compelled to compete because the holiday event raises money for cancer research. During the race, teams consisting of six competitors brave London’s cold temperatures and make their way to the Convent Garden in hopes of crossing the finish line the fastest without their pudding toppling over. The team that places first gets to lay their frostbitten paws on the coveted Christmas Pudding Trophy, and of course rub their victory in their rivals’ pudding-covered faces. What’s a winter fest without seeing a fascinating ice sculpture or two? However, not just any ice sculpture is able to make its debut at the Harbin International Ice and Snow Festival. The event, which will take place on Jan. 5- Feb. 25, showcases some of the world’s most grand frozen structures in a sea of colorful lights, with some mirroring the forms of famous monuments. Topped with fireworks, competitions as well as an ice lantern art fair, this is one festival where spectators welcome goose bumps. 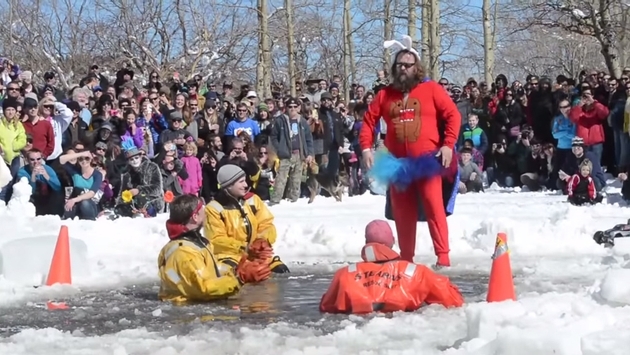 Once again the folks of Colorado have found a way to ring in the winter months in their own… unique way. This time the city of Breckenridge get their party on at the Ullr festival, a Viking celebration that is dedicated to Thor’s stepson and the god of snow, Ullr. But before you put on your huge horn helmet and dash for the powdery slopes, you might want to make your way to the Ullympic performances which promises to provide tons of laughter with frying pan throwing contests and a parade marked by marchers wearing oversized Viking heads. Before you know it you’ll be banging beer mugs with fellow celebrators and chanting to the winter god too. For travelers looking for an extraordinary fishing experience, the Hwacheon Sancheoneo Ice Festival aims to please. When the Hwacheoncheon Stream transforms into a sheet of ice during the dead of winter, it is swarmed by trout-hungry visitors hoping to catch their live seafood. But if you wish to fish like a local you might want to lose the rod and reel and try your (ahem) hand at bar-handed fishing. Skip to the 1:27 mark in the video below to watch the insanity. Just make sure you use your sea legs when tussling with your trout unless you want to spend the rest of your holiday sleeping with the fishes.